In your pursuit of KING-SIZED MASS you will be hitting the iron like a BEAST! That means you will need KING-SIZED RECOVERY. Flooding you muscles with the protein and carbs in KING MASS XL will support GLYCOGEN storage and recovery preparing you for your next brutal workout. 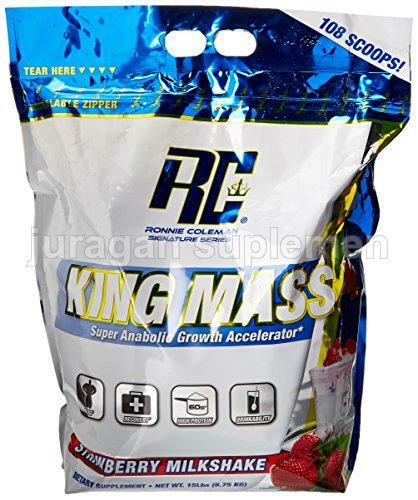 Directions For King Mass XL: Suggested Use: Consume 1-1.5 grams of protein per pound of body weight through a combination of KING MASS XL, high protein foods, and other whole food calorie sources. It is best to consume your protein intake over several smaller meals spread out evenly throughout the day. For optimal results, KING MASS XL should be used in conjunction with a weight training program along with proper rest under the supervision of a professional. AVAILABLE FLAVORS : CHOCOLATE / VANILLA / STRAWBERRY.